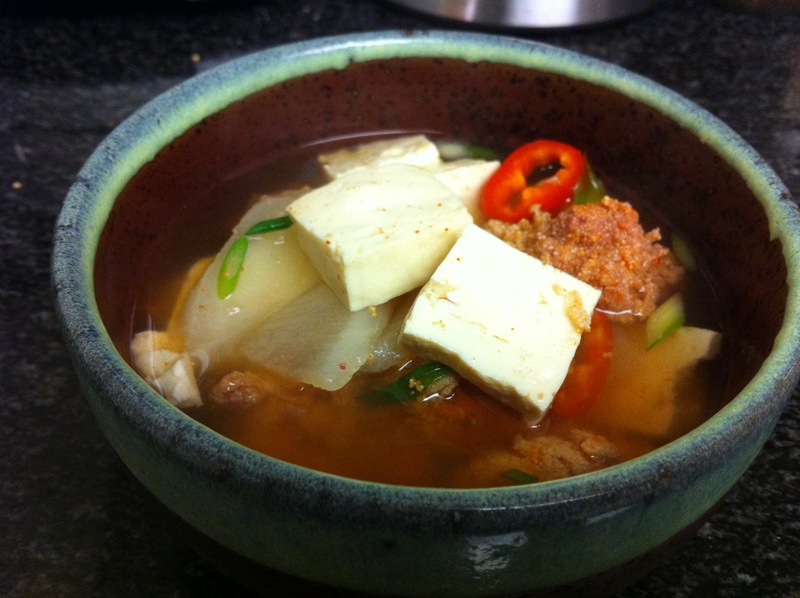 One of my husband’s favorite tang (탕, soup) is al-tang. He especially loves his grandmother’s al-tang that I will introduce today. 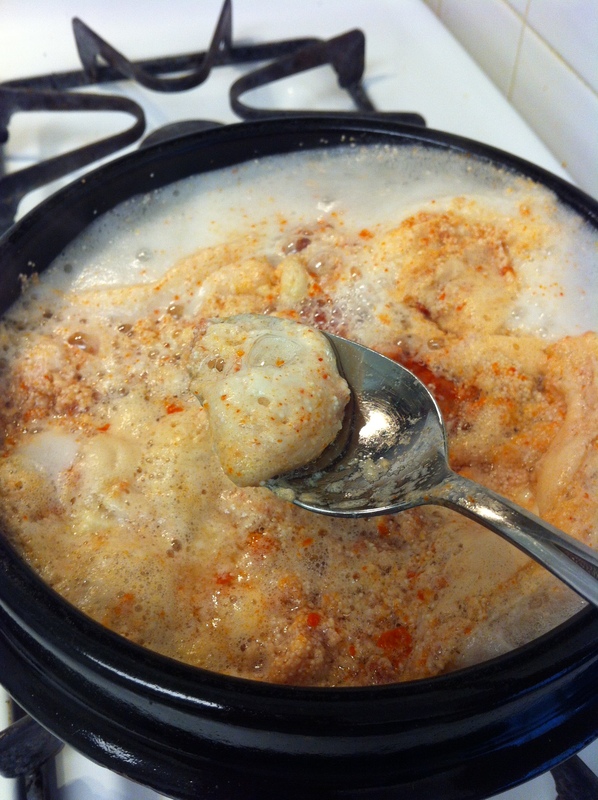 This recipe consists only a few ingredients but is delicious. 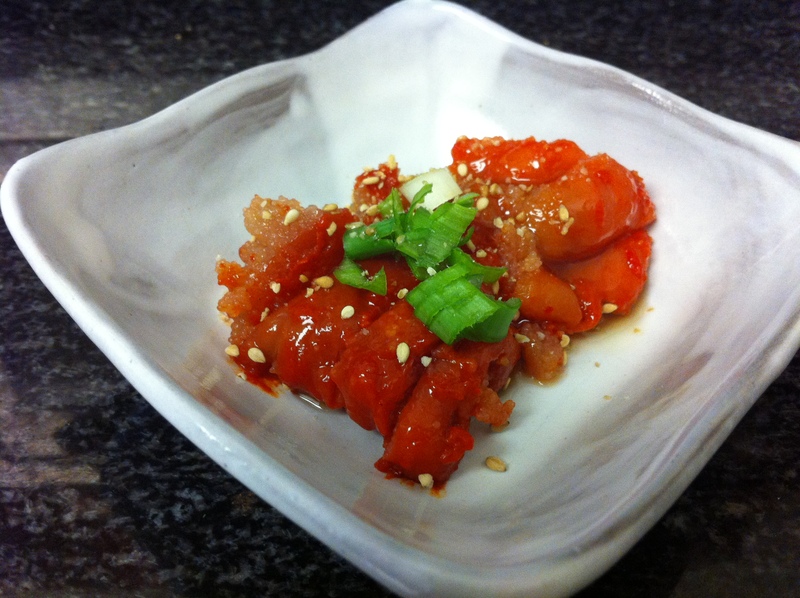 It uses myunglan-jut (명란젓), which is a salted roe of pollack. 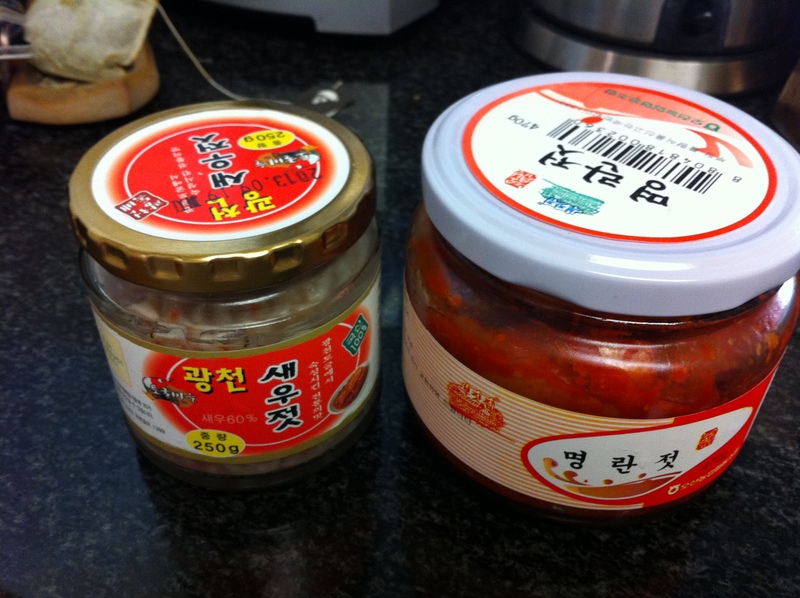 You can easily find this ingredient in Korean or Japanese supermarkets in the refrigerated or freezer section. Myungland-jut costs a few more dollars than other jutgals or salted seafood but it lasts a very long time in the freezer. It is also a wonderful banchan (반찬, side dish) simply by cutting it in bite size pieces and serving with a drizzle of sesame oil and a pinch of toasted sesame seeds. 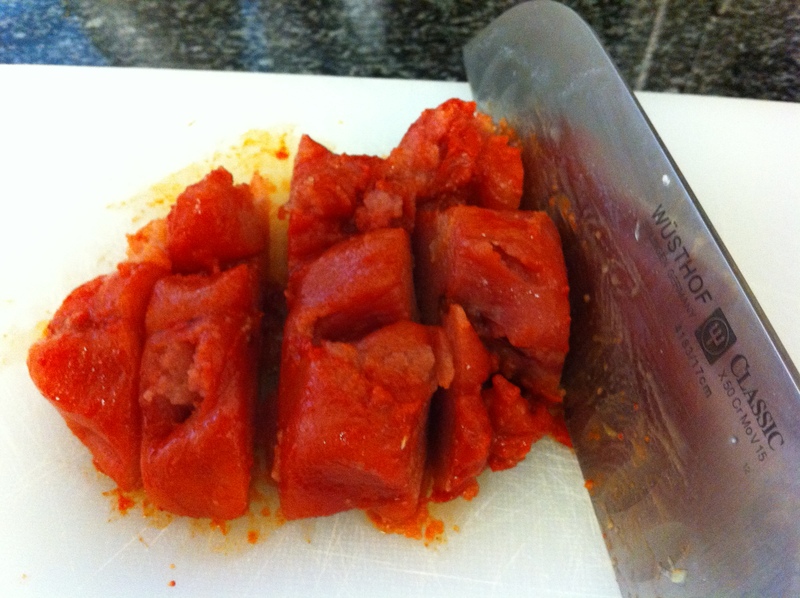 Cut the of myunglan-jut (명란젓, salted pollack roe) into about 3/4 inch (2cm) pieces. Spread the moo slices across the bottom of a small pot, preferably ttuckbaegi (뚝배기, Korean earthenware pot). 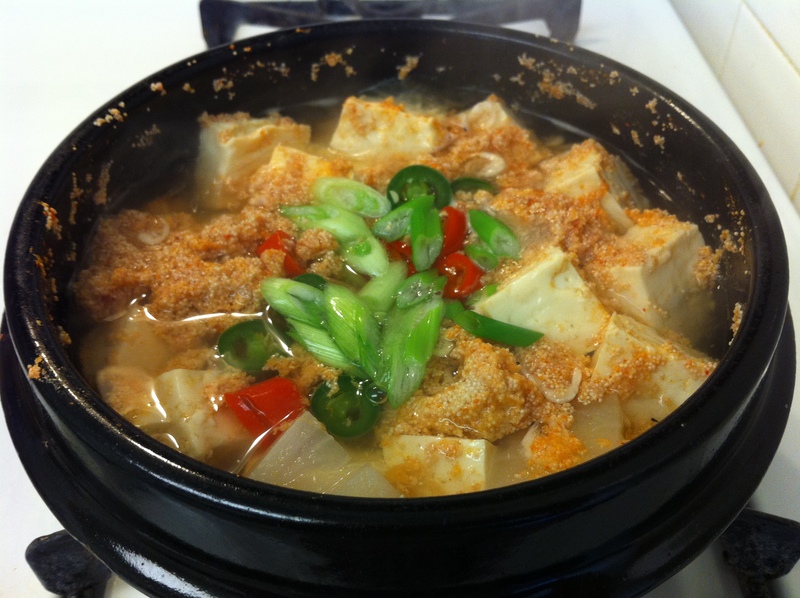 Place the myunglan-jut on top and carefully pour about 2 cups of myulchi broth (멸치육수, dried anchovy broth). Heat the pot on medium heat. Cooking this dish gently on medium heat and not high heat prevents the fish roe from falling apart. Scoop out the foam that forms on top. 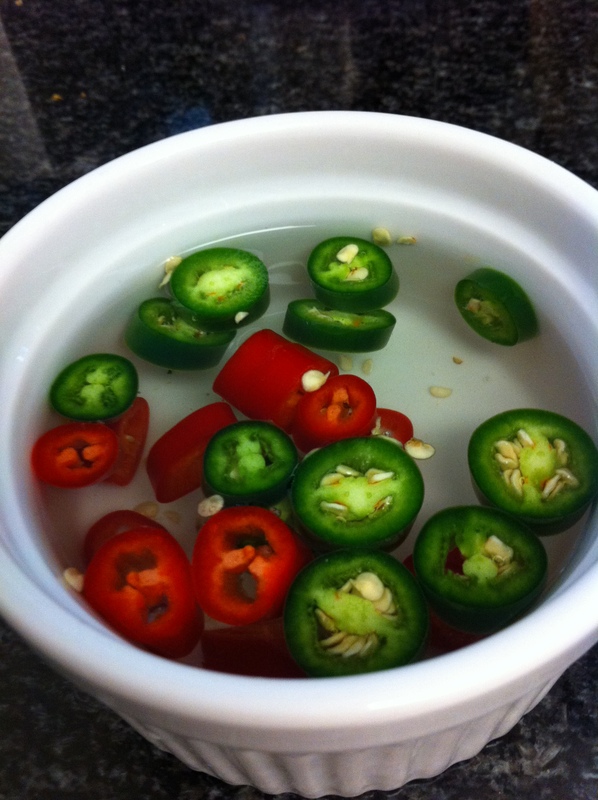 While the soup is cooking, soak the cut chilies in a cup of water to remove the seeds. 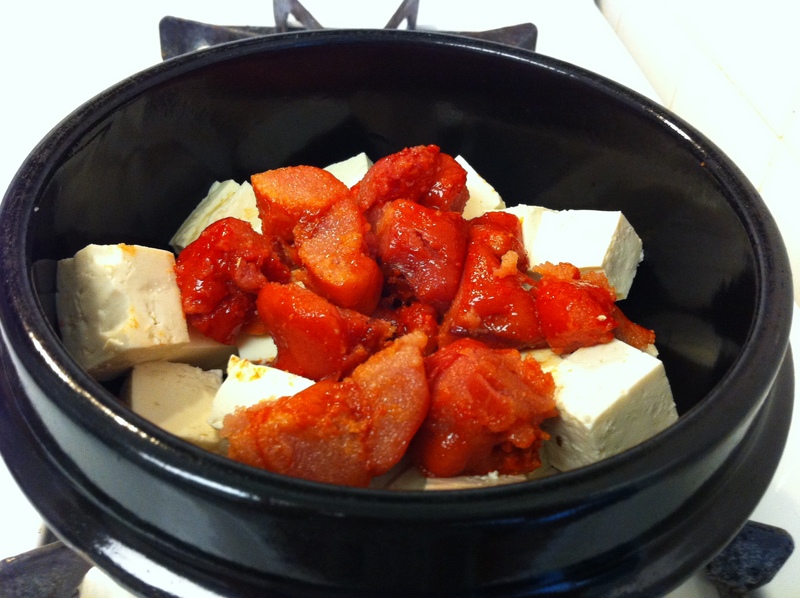 After about 10 minutes, add the tofu, chilies and scallion. Cook for another 5 minutes. You can also sprinkle about 1/2 tablespoon of gochgaru (고추가루, red pepper powder) if you don’t have chilies or if you like you soup extra spicy. Season with saewoo-jut (새우젓, salted baby shrimp) or salt. I didn’t have to use any more seasoning for mine because the myunglan-jut was salty enough. 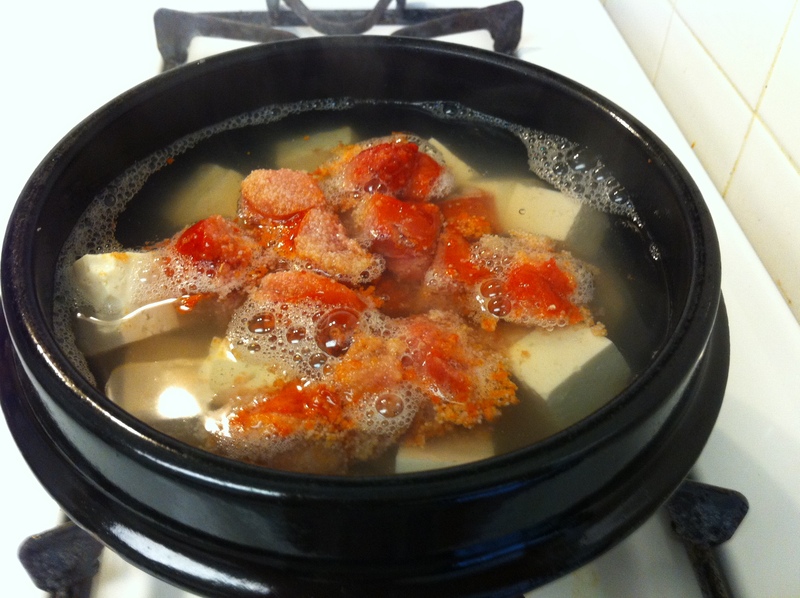 This entry was posted in Good for dinner, Good for lunch, Seafood, Soup/Stew (국/탕/찌게) and tagged Moo, Salted Pollack Roe by gangnamkitchen. Bookmark the permalink. About 30 mins or so. Thank you for the question! It takes about 30-40 mins. Thanks for the question!